This review has been a long time coming! The Neo has been available for close to eight months now so there's already a ton of reviews detailing the technical specifications, low noise, and general build of the unit. All important things to cover, but there isn't many that dive into the actual user experience. What are the ins and outs of the Neo? What's the ride really like? And the #1 question, how does it compare to the Wahoo Kickr? Tacx: Neo Official Product Promo Video. Lots of polish. Everything you expect to see and hear. DCRainmaker: The Tacx NEO Smart Trainer. Covering unboxing, technical specifications, and a few quotes I'll revisit in further detail below. 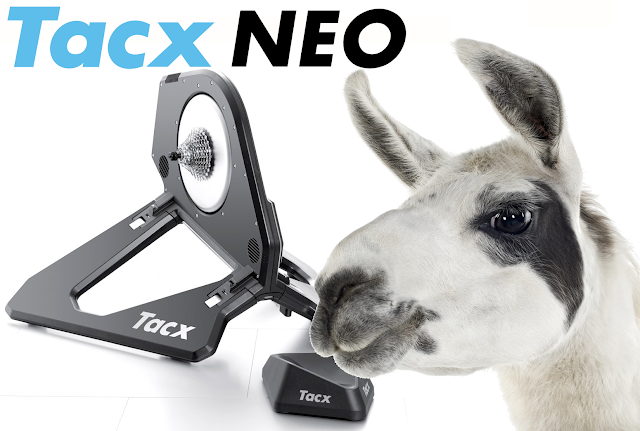 Tacx Official FAQ - Tacx Neo Common Q&A. - Unboxing and setting up was straight forward and simple. No assembly required. - Cassette installation on the Edco MultiSys freehub (Shimano and Campagnolo compatible) was straight forward. Shimano lock-rings are now supplied with newer Neo units. *As of January 2018 the Neo will ship with a Shimano/SRAM compatible freehub only. - The unit is heavy. That's ok with me. I don't plan to move it around on a regular basis. - Some people mention the plastic shell looks cheap. I really like the look of the unit. Star Wars meets Tron with some Fast and the Furious neon lights for effect. - Owning a Neo means you're inducted into the The Flat Earth Society, like it or not. There's no 'feet' to adjust or level the unit. You'll have to get creative if your floor isn't level. - The glowing lights under the Neo are nice visual for the pain cave, but are of no real use. I could imagine them being more interesting in a spin room full of Neos where you could tell how hard other riders are working (blue = easy. red = in the red zone!). - The unit can be used without power. The energy you're putting into the Neo from the bike will power the unit. That's pretty cool. As for using this unit outside for warm ups? That idea isn't all that practical. The unit is too big to haul around, it's heavy, and it isn't waterproof. I'll be sticking to my LeMond Revolution or CycleOps Fluid2 trainer for warm up duty. - The Neo will not accomodate all bike frames. 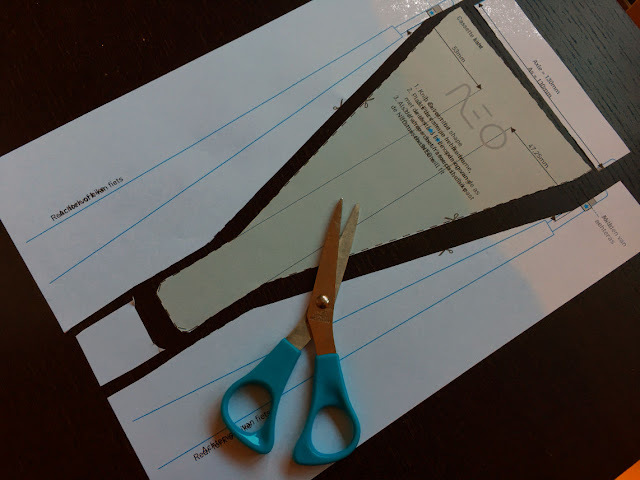 Tacx have templates to print and measure your frame available here. My Shiv TT bike is reported as being incompatible. Looks like it'll work with the 135mm spacer and a front wheel prop. Check your own bike(s) before purchasing! - The height of the Neo cover makes it a little trickier to put your bike on/off than other direct drive trainers. Not a huge drama, just something that's not the same as the others. - "Neo leans to the right" issue. Yes, it does. The Neo has maybe 20mm of play side to side when the bike is mounted. This is more 'wobble' than most trainers. Due to the offset of how the bike is mounted, more to right, you'll feel the bike move more right than left. This isn't a major issue, but it is noticeable. If your number one priority is low noise ergo sessions then the Neo is your answer. It is perfect for apartments or those who don't want to disturb the family at 5am. There is a low level hum that comes from the Neo. It's so low your drivetrain and the fans in your pain cave will mask it. DCRainmaker also has a video up on YouTube that demonstrates the sound of the Neo vs the Kickr perfectly. 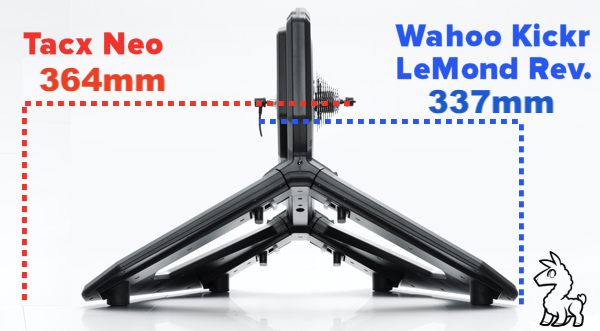 You'll be around 1 inch higher off the ground on the Neo compared to the Kickr or LeMond Revolution. 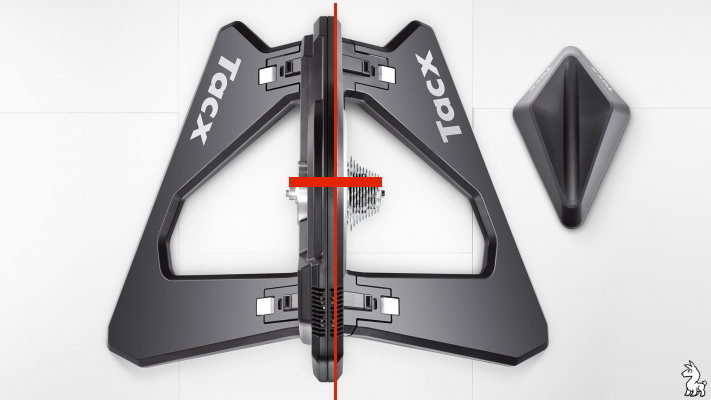 The supplied front wheel block from Tacx goes part way to propping up the front wheel enough to feel natural. Telephone books are my wheel prop of choice. This could be a seperate post in itself. I'll keep it short and sharp. My testing showed the Neo lining up within a few watts of my Quarq (calibrated with a 20.000kg certified weight). I got a second opinion from the doctor - Dr Stephen Lane from HPTek who performs step-tests on athletes more regularly than I have hot dinners. Two thumbs up from him too after testing with Power2Max, SRMs, and SRMs with oval chainrings (out by the estimated offset using those, data junkies you know the deal). Not having to calibrate or perform a regular spindown is win with the Neo. Nothing will beat the buttery smooth feeling of the LeMond Revolution. As for smart trainer road feel the Neo is pretty good, and getting better with recent firmware updates. User TarmacExpert over on the UK TimeTrialling forums has performed some detailed analysis of the Neo that is well worth a look if you want to dive deeper into this topic. Road Surface Simulation - Feel The RUMBLES! A much talked up feature of the Neo is the downhill drive simulation, where the Neo turns the freewheel on simulated descents when plugged into a power source. "when the NEO Smart is plugged into the wall – the trainer will even ‘propel’ you forward if you’re on a virtual downhill grade." Bike Radar. August 2015. No it won't. It'll turn the freewheel but this has ZERO EFFECT on 'propelling' you forward. All training apps calculate your virtual speed primarily from your power and the virtual gradient. This is completely independent of how fast your ergo flywheel is spinning. If anything, Downhill Drive is a slight hinderance if you need to keep your wattage up on descents as there's less resistance to push against. Setting the 'Trainer Difficulty' in Zwift to 50%-75% goes a long way to assist in this area. For full details of Trainer Difficulty feature within Zwift, see this ZwiftBlog article. This isn't a bug, or an error with either the Neo or Zwift. Zwift will apply a slight braking effect to your avatar when you're not pedalling to assist with bunch ride dynamics. If your virtual speed and downhill inertia isn't enough to overcome this braking you will come to a stop, but the Neo keeps spinning away like it's on a downhill. Again, not a bug, this is by design. It also proves that Downhill Drive does not itself propel you anywhere. The Kickr does a good job of simulating descents by significantly reducing resistance and letting the heavy flywheel spin up to carry inertia. Downhill Drive provides a similar inertia feel for the Neo. It propels the flywheel forward so you have to get on top of the pedals, as you do outside on a real descent. The first three green jersey sprints I tested the unit with on Zwift (~900W 20 seconds) resulted in an electrical odour coming from the Neo. The unit gets pretty hot under normal operation, so I suspect this is simply some bedding-in from the factory taking place. Maybe some excess glue on the heatsinks inside the unit? The Neo is a direct drive unit with no drive belt. It should be impossible for any tyre slip issues. Right? Under certain conditions I encountered issues with the Neo resistance backing off for a fraction of a second at the bottom of each pedal stroke immediately after maximum torque. I suspect there's some kind of resistance protection kicking in. I'm not able to quantify this with data as the sample rate of the Quarq isn't high enough. This is a noticeable anomaly when doing low speed hill attacks. The uniform resistance of the pedal stroke is interrupted. It has been described over on the Tacx forums as the resistance becoming "mushy". I've been told this "mushy" issue feels like you're running oval chainrings. I'm sure this similarity is a coincidence and isn't by design. This issue has delayed this review as I've spent a days researching this issue, testing, testing, and more testing. I've spoken to a number of Neo owners about their experience and there's a general consensus with the latest firmware updates the Neo has become troublesome for high torque sprint efforts. I have an ongoing channel of communication with Tacx direct at the moment looking into this issue and I'll update this post as things progress. The local distributor has been excellent, and the team at Tacx have responded to my queries within a few hours. This has been extremely helpful as I've worked on this article. Here's the real sticking point in Australia. The Neo has an RRP of $1899 $2199 AU$2499 (RRP updated recently), and can be seen as low at AU$1729 from online stores (beware of import duty and taxes!). You'll have to supply your own cassette with the Neo, so factor in another AU$50-$100 on top. Wahoo Kickr has an RRP of AU$1599 (with cassette supplied). Rumours of multi-buy discounts can bring this down below AU$1500 if your local store is willing. 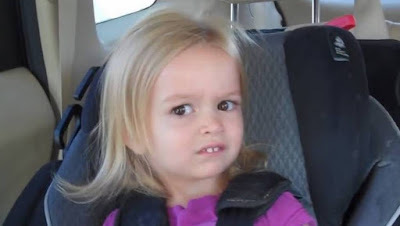 The going price for a 2nd hand Kickr is from $800-$1150. In Europe the Kickr and Neo are both the same price. I'm not sure why the Aussie market is so different. Tacx will need to review the Neo price here in Australia if they're going to move anywhere near the same volume as Wahoo with their Kickrs. Levelling the Battle - The recent Wahoo counter punch! "What differentiates the NEO though from something like the Wahoo KICKR are two main aspects: Downhill drive, and noise. Or rather, lack thereof. First, the noise from the unit is pretty close to silent." - DCRainmaker, September 2015. Knowing what I know now about the Downhill Drive feature of the Neo, and taking into account the recent update by Wahoo to Kickr firmware 1.4.47 that incorporates acceleration power and better simulation mode operation - The head to head battle between these two smart trainers is closer than I first thought. The only feature of the Neo that differentiates the two at the moment is the noise. And the Kickr isn't too obnoxious when it comes to that. Is the Neo bad for my carbon frame? No. Ergos don't break bikes. Misuse does. Is the Neo a good trainer to buy? Yes..... if you can get a good deal on one. Is it the silver bullet of smart trainers? No. Will I be selling my Kickr? No. What are main differences between the Neo and the Kickr? No calibration required on the Neo. The road surface simulation. You didn't cover X or Y about the Neo! There's a ton of things I haven't covered, I'll add them in if there's a lot of queries. Fire away in the comments section! Will these answers change? YES! Just as Wahoo released a game-changing firmware for the now three year old Kickr only a few weeks ago, I'm certain Tacx have a few tricks up their sleeve in the near future. I'll keep a changelog at the bottom of this article. - Updated Q&A now the Kickr18 is silent too. - Import duty and taxes if buying overseas. - Find a Dealer link added. - Zwift updated to stop infinite flywheel spinning under certain conditions. - Quote from Tacx representative about the SMELL! - January 2018 onwards Neo ships with Shimano/SRAM freehub only. overall,the Neo is an awesome trainer. Love the built in side to side movement (sort of like the rock n roll kinetic, but less). Kickr doesn't have this. The Kickr power isn't as accurate and is affected by temperature, time riding, etc. Consistency is important. Kickr lacks this. Neo looks way cooler. Not sure on the longevity of a virtual flywheel (Neo) vs a belt driven flywheel (Kickr). I need to agree with the blogger re: downhill drive and virtual tire slip. I believe the virtual tire slippage is an error due to an attempt by Tacx to keep the wattage accurate and road feel real with increases in rpms and/or power while in same gear) is in use. The problem is similar but differently applied when using workout mode in Zwift (haven't tried other programs yet). if you preset to 250W or 300W. It makes each pedal stroke easier to push at higher rpms but overall wattage (250 or 300W) stays similar. The problem is, Tacx applies this rule too immediately i.e. It feels like they apply this rule to the speed of each individual pedal stroke and/or power outlayed to each pedal stroke vs accounting for the affect or avg speed/power applied of the prior pedal strokes. Hope this makes sense. As I mentioned, I've only tested this in Zwift. Trying to keep at 300W in workout mode is difficult as the changes in power needed per pedal stoke is too immediate. You have to really concentrate on keeping your rpm's uniform which is hard for mashers like me. Perhaps Tacx need to work more on how their rpms are measured to fix this issue. It could be a Zwift coding issue. Has anyone tested this in tacx software? When on an outdoor drive train if you stand up and accelerate in a medium to heavy gear you can also generate more wattage even though it feels easier to push for each pedal stroke. But this easing up of torque needed is much more gradual and is relatively smooth (even for mashers like me). Hope tis makes sense. I had a Tacx fortius years ago, had similar issues, would work fine for lower efforts but when you put down some decent power it would have points of resistance interrupting the pedal stroke. Most times it got so bad that it made it unusable. Reading forums and discovering others with the same issues a new motor, or new power supply fixed the issue for a while, but the issue would eventually return, then requiring a new motor or p/s again, at over $200 a pop the trainer was put aside, not even useful as a clothes hanger as its to low to the ground. Good to see they have nearly sorted the issue out after 10 years of development. I just tried my Tacx Neo without a power cord attached and found that it doesn't appear to suffer from virtual tire slippage. I am however am on the new update. If it slips in game, it means it is in the software coding, not the hardware. Is this similar with others out there? It worked with my Shiv. Just... pretty close on the rear stays. Hi Shane good review, I'm currently considering a neo. you say with the Aussie price difference "kickr or neo" - kickr. with the firmware updates the neo has recieved, its come down a touch in price and you have been riding it more is that still your opinion? Acs - The price is said to be going up on the Neo... so watch out! :) I prefer the inertia feel of the flywheel on the Kickr, especially under acceleration (sprints/hill attacks). The Neo comes close. Very close. And if low noise is a requirement such as live streams, I'm using the Neo. Hi Shane. Has the problem of the "mushy" sprinting been resolved with recent firmware updates? To an extent, yes. They've greatly improved it with the firmware that followed up soon after the feedback and data I posted. First off I am a big fan and enjoy your Youtube videos a lot! I am in the market for a Neo due to its low noise in an apartment setting. I tested one at a local dealer a few days ago and it was very quiet which was great. However, at low cadences (say 50-60 rpm) with power ranging from 100 W to 300 W, I could feel a pulsing / vibrating in the pedals that even caused the rest of the bike to pulse / vibrate. The dealer assured me that this is normal and is due to the fact that the trainer uses magnets spaced around the circumference of the "disc". But to me, it seems like a unit this expensive should be silky smooth no matter what type of pedalling you are doing. Does your Neo exhibit anything like the above mentioned? I have read a TON of reviews on the Neo but no one really seems to mention anything like this, aside from people who bought the initial version in Fall 2015 and complained of all kinds of sounds and vibrations. G'day Simon. It sounds like what the 'road surface feel' does.... what you're describing doesn't sound normal. I'd have the dealer show you another unit, or test ride at another store/location/mates place. Hi Shane. Thanks for the confirmation on the firmware update. Your review doesn't touch on your thoughts regarding long term reliability. Some reviews of the Neo note there is a degree of flex in the structure of the trainer that is noticeable when riding but also when handling the unit. Given the cost of the trainer this is a consideration for me and I would be interested to get your thoughts on the overall robustness of the build in comparison to similar trainers such as the Kickr. The Neo does flex more than other trainers, I believe I've mentioned or demonstrated that somewhere. It's not a negative thing, or a feature, that's just how it is. Robustness / build / etc has a lot to do with how it'll stand up over time, and that I don't know. Buy local and ensure the warranty is valid. I've tried to find a definitive answer to a particular question, but failed miserably: What happens if you try to fold up the neo with the bike still attached? I understand it probably won't fold completely, but i've got a space challenged apartment that (luckily) has enough space for a permanent trainer bike. BUT, the folded out footprint of the Neo will make it a tripping hazard (my trainer setup is in a hallway). Is it pretty much impossible to get to the latches that allow the Neo to fold, when a bike is attached? If it's folded up, will the weight still be on the 'wings' or the 'feet' of the central unit? I'm sure i could rig up a simple cable that keeps the wings 'up' when folded, and am more than capable of lifting the ~30-35kgs of the unit! I have no idea to be honest, and I'm not willing to risk either my bike or fingers to find an answer! :) I can confirm it isn't designed for this and it'd likely push up against your rear derailleur and rear stays in a way you really won't like. I'm a tester too and worried that it won't let me do the range of training I can do on my fluid 2 + Power2max therefore think it's an expensive way to just play Zwift with the smart resistance etc. With this I've got a few questions of which I know it is 1 & 2 but it's #3 I'm unsure about. 1) Ican play on Zwift Like how it's meant to be - i.e go up the hills and it gets harder and then resistance is removed when going down hill etc. 3) can I set my workouts on zwift with power or cadence requirements etc and obtain those results in what ever way i like (Like i do now with my fluid 2) i.e i put it into a harder gear / pedal faster and my PM reading goes up. Effectively using it as a dumb trainer? 3) Yes, just put it in resistance mode. But a LeMond would be cheaper and better if you're not in need of the full immersive smart trainer experience. Th me for your response Shane, heard good things about the lemons thing is I do use Zwift and have done for a year to make the daily turbos more interesting. I would like the option to have the automated resistance for "playing the game" when I'm not on a structured plan but the oppetuniyy for free rides on Zwift is going to be far less so Ide like a smart trainer that's going to suit the style of training as a tester. However like you, because of the mobility of these things I think I'll still need to keep hold of the fluid 2 for pre race warmups. Mate I have been trying to make a choice inbetween Drivo and Neo for 1 month, but can't choose one! Neo's silence and road-feel praises sound promising but the average consumer satisfaction on forums is quite low, many people reporting physical issues with it. Havent heard anything bad about Drivo, it's comparably high noise is the only issue. Which one should I go for ? What's your final line for this comparison ? Test ride both. Choose the one you like. That's the best advice I can give. I won't do the hard sell either way. Hello Shane, so the lemond has the best road feel ever? Nothing has yet come close to it? I have one in my country house and there is no issue with noise. I'm worried about my city apt. If I take a second one there so I was looking for a kickr, a neo or anything else but with priority to road feel. Which one do you recommend? I like the LeMond Revolution, a lot. But it has zero smarts or interactivity. It depends. If you want/need smarts (ANT+/BLE/Power/etc) and interactivity then it's no good. Base on Lama's advice I tested out another Neo at another bike shop and found it smooth enough to make a purchase. I actually found that after a couple rides the Neo even "broke in" a bit with my bike and there was no more vibration in the pedals at all. Since then I've probably logged about 75 hours on the thing and so far I am pleased with it. My neighbours say they don't hear it, power is very close to my Pioneer PM, and it responds well to resistance changes in Zwift and Trainerroad. I used to own a Kickr and would say that the flywheel on it made it feel a bit more realistic compared to the Neo. But the lack of noise / vibration in the Neo is way better for me now that I live in an apartment. It's not completely silent but it's definitely tolerable. Plus the power measurement is way more accurate and repeatable on the Neo than the Kickr in my experience. My two cents. Happy riding everyone! great video content i like how honest you are are with your video, i should have taken a warning from your tacx flux video, i brought 1 too and true enough it emitted a strong burning electronic/rubber smell after 1 ride. am returning it now. anyway now im really cautious with the next trainer i am getting. i am considering the neo and drivo. seeing as you have owned both for a decent amount of time now and they are pretty similar, how would you rate the durability of this 2 trainers and being fault free? thanks Shane! The problems you had with the two Flux units you received convinced me to avoid and purchase a Neo. It's replacing an old Vortex which has a unreliable brake unit and I just want a quiet and reliable unit. No luck though - instead of a smell at around 1000W the Neo failed and dropped to no resistance with the red light flashing. Swapped for a second unit and it too does the same thing, albiet at slightly higher wattage. Doesn't matter if it's plugged in or not and it happens with Bluetooth using the Tacx android software and TTS4 on a PC using ANT+. Not sure if it's worth trying a third unit or calling it for a refund. Both times it was a new 2017 model and had just been unboxed. Have you heard of such issues or am I just getting units from a faulty batch? Does your unit ever just release all resistance at higher wattage? Hmmm.. I'd check the status of the unit with the Tacx Utility App.. Is it over heating? Mine has held up during repetitive sprints around the same wattage. Thanks heaps for the suggestion. Installed the Android version of the Tacx Utility App and went to the Testing Dashboard. Saw the wattage get up to 1054W and then it happened again (with and without power plugged in) Reporting what looks like a red over voltage error(the red triangle with over underneath). I had a chat to the retailer in Aus who is following up with Tacx in Melbourne regarding the testing of the first one I sent back. When I get an update I'll pass it on to you via this Blog. Thanks again for your suggestion. I promised an update for people who may get an over voltage problem with their Neo. Unfortunately I don't know why but 3 different units all got the same problem so I've given up and gotten a refund. I never got an answer as to why it happened. Friends tried the units I had and didn't get the over voltage error but also never got the wattage up to the same level. The units worked great until they got the error and I still love the standalone (no external power) ability and how they fold up for transport but I can't use a Neo if every time I do sprint interval training they cut out. Maybe I was just unlucky and scored a bad batch. Really appreciate your help and find your reviews very helpful. I have a Tacx Neo purchased in September 2017. Power numbers seem off. I can't seem to break 1000 watts in 30s intervals. My 5s power is around 1400w according to my crank power meter which i have confirmed numerous times on a watt bike. Tacx power seems useless for sprint efforts. You'll need more data points. Specifically comparing a Neo sprint effort to a power meter that's on the same bike at the same time.